Never Ending Evolution of Hitachi Zeeman Atomic Absorption Spectrophotometer ! 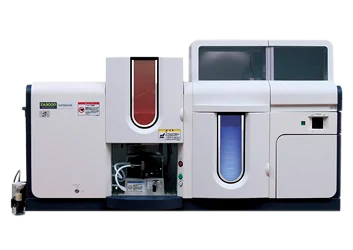 ZA3000 series developed to meet user&apos;s needs is a new elemental analysis instrument which employs the technology unachievable by other atomic absorption spectrophotometers so as to enhance the functionality and reliability while preserving the basic performance of the polarized Zeeman atomic absorption spectrophotometer, such as high accuracy and high sensitivity. Graphite furnace analysis gets enhanced accuracy. By using the specially designed cuvettes, the twin injection function which allows analysis with enhanced accuracy can be utilized. The power consumption reduction by automatic turning off the hollow cathode lamp during the analysis stand by realizes energy saving. The function to automatically detect bumping is introduced for graphite furnace analysis. Bumping of a sample at the drying stage, which reduces the analysis accuracy, can be automatically detected. By adding the function to suppress the memory effect and speeding up the dispensing process by the auto sampler, the analysis with better speed and accuracy is also achieved. The polarized Zeeman correction method by the DC magnetic field, a technology of Hitachi instruments, achieves "Enhanced basic performance" and "Introduction of new functions". While the background corrections for all elements provide the high reliability, users are strongly supported for their analysis by the software.